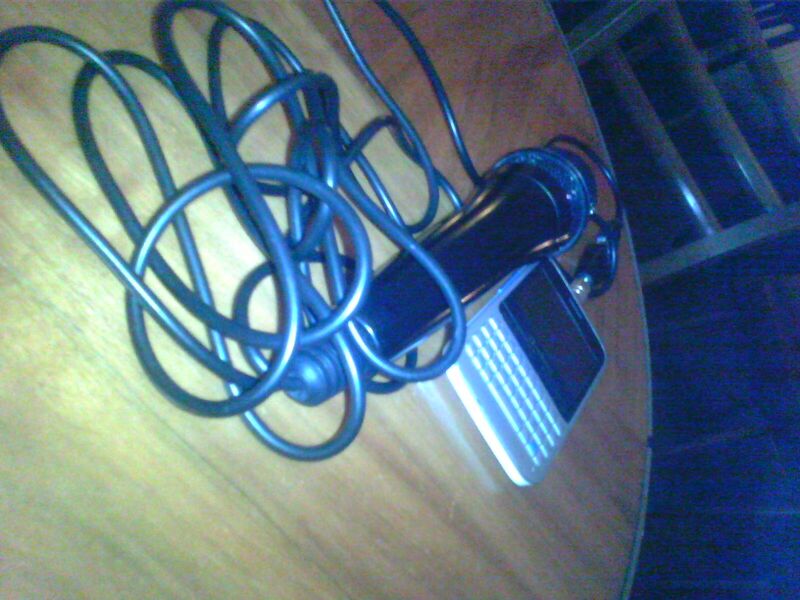 While using mic having adepter to phone for people interviewing each other and then uploading it to our site to be edited and distributed to labels being channels in the liquid unions platform. =0 = (1 / x inPowerOf(infinite)) *( x inPowerOf(infinite)) = 0*infinite since 0+0=0 ! For a better world: Developing new plugin making bp group a platform for common company defined here ("ComCom" stands for Common Company and "ComComized" means turned into a comcom). Please contact for payment per hours in developing this on github in addition to this GCCP partnership. 1st step: The platform become peer owner in the group being comcomized, as the platform pay its share with some free/better services of the platform "g" to the group and "m" to each of its members . 2nd step: The group become peer owner in the platform after the platform exit the group. Note: If the platform is Dcomcomized and after the members of the group enter owning the platform in 2ndstep, they can become be regrouping in the platform as a noter comcom owning as oernery owner potion in the platform. and the field=blob[element of the children of the element]. Copyright Erez Elul @Namzezam 2014. To be developed under this contract http://yes-again-we-can.wikidot.com/contract:comcom-dev and is permitted only under this Humanitarian AGPL License: You are not allowed to use, produce from or design from this or its part, anything contained with the aim to kill, to torture, or without their consent, to cause harm to or to monitor people and any permission beside this restriction is granted here only under the Agpl License! 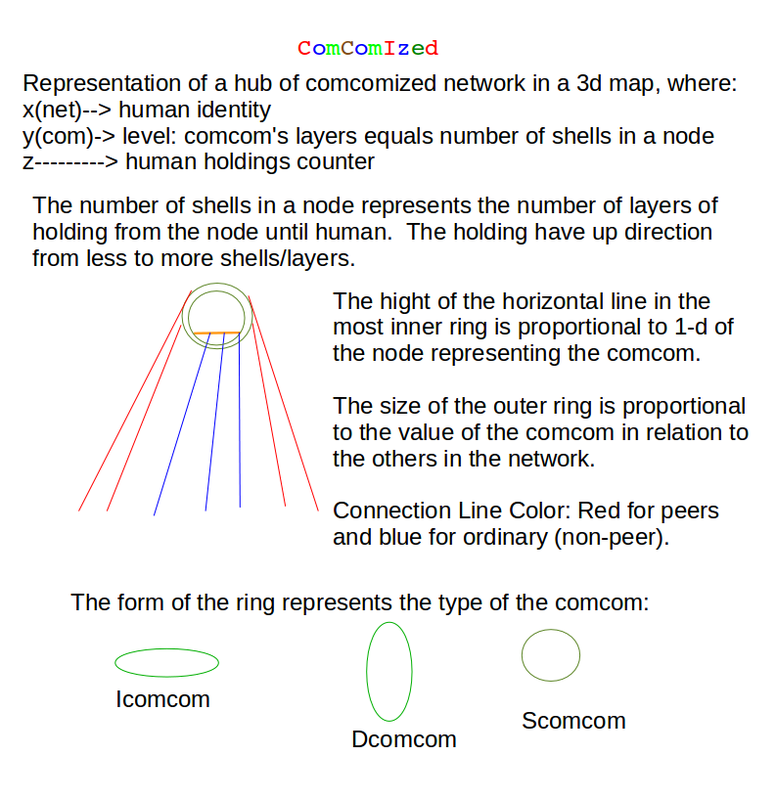 This p2proles protocol is of p2p (+ rotated hubs) processing pages in recursive correspondents enclaves and it's used in p2p network of which individuals has specific roles, such that the visibility of the data in the network is in a neighborhood and role dependency, while the visibility for anyone in the Internet is made by another p2pweb hosting. As each peer has the number of existing members the new pgid can be produced after being signed by all existing members, which then with the iiaom of the new member the new position and the double merkle trees are produced. (periodically: Receiver=H(msg)=>corespondentS) periodically the sender send its hash to all correspondent, so that the group could validate both the communication and reliability of the hub. A# (as in add)of paged to be added. The number of is visible only to owner, where only owner can remove and if want would move to W or O and any owner of page can add. 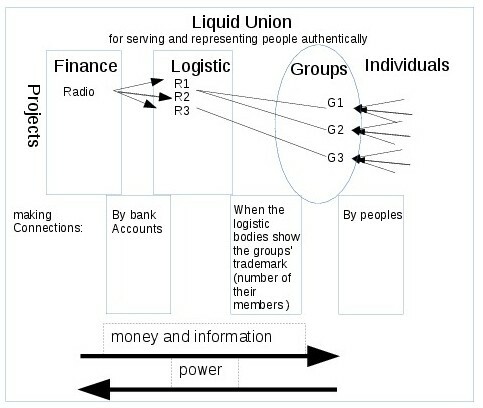 account == Pgid of one user allocated by lu op only once to one role in liquid union. hub == using one account or one group of accounts to serve as specific admin role in the liquid union. The hub is the witness of transaction and distribute them on request to other peer in the same context. optinaly uploaded to the cloud. 20) Is this how your crosses normally become swords? How could you let your constitution see you violating human right so normally? Was using police with mainstream media powers to normalize your population's patterns the trick? Normalizing is not holy and is expensive imitating natural being(s) and so how long could you keep being normalizing people and exactly who are you for doing that? Freedom of movement of people and of information are essentially linked - one cannot exist without the other and not knowing makes people become ignorant and arrogant as they are seeking love to be protected by until, like spoiled lunatics, they turn sadistic, is this how your crosses normally become swords? In the memory of thses 17000 deaths coused by forntext! AGREEMENT between the people of the world hereinafter referred to as "the Parties", AWARE that the ever closer union of the peoples of the global Communities should find its expression in the free movement , ANXIOUS to strengthen the solidarity between the peoples by removing the obstacles to free movement CONSIDERING the progress already achieved within Communities with a view to ensuring the free movement of persons, PROMPTED by the resolve to achieve the abolition of checks at borders and to facilitate the movement of all people. Article 1: As soon as this Agreement enters into force all checks are abolished completely. Article 2: With regard to the movement of persons, from 1st June 2014 the police and customs authorities shall carry out no surveillance, they may not interrupt the flow. Article 4: The Parties shall seek solutions enabling them to waive state borders. Article 5: NO checks shall be put in place. Article 6: Without prejudice the Parties, shall take the measures required to facilitate the movement of all people. Article 7: The Parties shall endeavour to abolish their visa policies as soon as possible. Article 8: With a view to easing differences between people the Parties undertake to coordinate their actions. Article 9: The Parties shall reinforce cooperation. Article 10: With a view to ensuring the cooperation provided for in Articles 6 to 9, meetings between the Parties' shall be held at regular intervals. Article 11: The Parties shall waive borders. Measures shall be taken to avoid checks. Article 12: From 1 June 2014 checks on documents shall be Abolished! The Parties shall determine the features of this symbol by common agreement. Article 13The Parties shall endeavour to harmonise. Article 14: The Parties shall seek solutions to reduce borders. ­ to do their utmost to stop borders. Article 17: With regard to the movement of persons, the Parties shall endeavour to abolish borders and shall endeavour first to harmonise where necessary. (b) examining any difficulties that may arise in applying agreements. Article 19: The Parties shall seek to put down arms and explosives. Article 21: The Parties shall take common initiatives within global Communities. Article 24: With regard to movement of the Parties shall seek means where necessary, to not adversely affect the necessary protection of the health of humans, animals and plants. Article 25:The Parties shall develop their cooperation. Article 26: The Parties shall examine the framework of the global Communities. To that end they shall support the initiatives undertaken by the global Communities. Article 27: The Parties shall examine Community law. Article 28: Before the conclusion of any bilateral or multilateral arrangements similar to this Agreement that are not parties thereto, the Parties shall consult among themselves. Article 29: This Agreement shall also apply to Berlin. Article 30: The measures provided for in this Agreement which are not applicable as soon as it enters into force shall be applied Immediately! Article 32: This Agreement shall apply provisionally from the day following that of its signature. Set of population->Project->Channel<-Group<-Individual: An idea for true representation in self governing of contradicting groups having their trademarks for governing their channels in projects or issues which are financed together. print and try our new mini platform for liquid union workshops meet and startup. How to avoid misrepresentation of contradicting groups and not being stuck with and sucked by misbehaving in their financing through donation tax and/or dividend? the membership of the people, able to be in one of the groups, is done by the logistic, using one "membership" folder in each group while implementing iiaom protocol. one logistic could get flow from one or more finance but only for projects and never per channels of such projects, where channel0 is of groups having not yet their channel but the flow goes there considering the population. criteria of projects are created such that in each criteria each member has only one identity for having democratic voting between the projects. each event of creating group or of member's movement between groups, must be immediately registered and be depended only on the member. This is really on unique identification of the members' union, implementable in the events of having new member or losing one. officials in the unión must provide the history of all their jobs in the unión. The Humanitarian Home For Human Beings (HH4HB) is an association formed as a liquid union (see it constitution). Its aim is assisting discriminated populations, like refugees and migrants, govern by the populations authentically and while avoiding misrepresentation, while focusing in reducing gaps created in unjust societies, such as the capitalistic ones, or any other society which value products, documents or religion, ethnic or cultural values more than humans. Its Objectives are creating better transparency about the discriminations, like by providing radio and library together with documentation of the story of the migrant and refugees in such societies, while reducing the social gaps, by providing assistance in fields like law representation, health, food, hosting etc. A) caretaker over projects benefiting and govern by Refugees and Migrants. where the privileged is given to the members of the groups in the condition of the implementation of those privileges is made by the group. We agreed to continue at 17/06 in 10:00 morning in finding the way to realize the liquid union by founding minimal structure of the finance and logistic associations., where the membership is not of members in both associations, but in the groups having the trademarks assigned to the channels (in the logistic association) per each project (in the finance association)..Hence, our job is of plumbing and creating both associations as sealed pipes connecting only and all flows of money from donors to projects in the finance association to contractors running channel been care take by the logistic association. What was left to search is if, or how much of, the the association tasks is to be given "out sourcing" to contractors or to inner functioners? The summery of the meeting in 17/06: we will try to find the people for both skini associations finance and logistic, and then approach via to realize the liquid union. 17) Terror or systematic error? False manifestation of the German normality formed by torturing! Terror or systematic error? False manifestation of the German normality - doubtfully civil and certainly German, having only 1 shower for 200 people for a year, being restricted from sleeping, protection from nature, or food and water is torturing, also when is implemented only against acting in political manifestation, being black or in gathering! This reality in Germany is daily done for forming the look of the public opinion in the public, for to shape the German normality, which is a legal term serving any policeman to restrict as non-normal being who ever for nothing! We as the refugee movement could ask for some advice here. 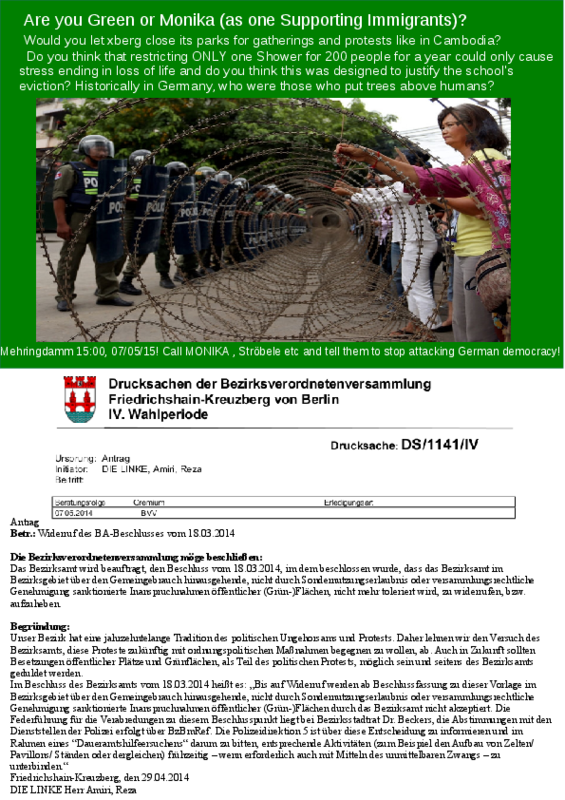 16) FreeXberg - free xberg 4 gatherings and protests from monika or the greens! Xberg won't become Cambodia! No Freedom of movement of people! No Freedom of information! Where? In berlin Xberg. Who tried and failed to make it? The Green PartyPolice! #freeXberg is a platform for gatherings and protests in Friedrichshain-Kreuzberg having in common the demand to Withdraw the bill "Widerruf des BA-Beschlusses vom 18.03.2014" and blame monika herrmann for secretly giving the key of sovereignty of Kreuzberg to the berlin police. Now after exposing the secret deal of moika and the berlin's police to lose xberg's sovereignty unproportionally to their excuses for unlimited time, for every where and against any one or any issue. We are building a new coalition of gathering and protesting people with politicians bringing information political awareness and a kind of protection by actually visiting the events. Are you Green or Monika (as one Supporting Immigrants)? 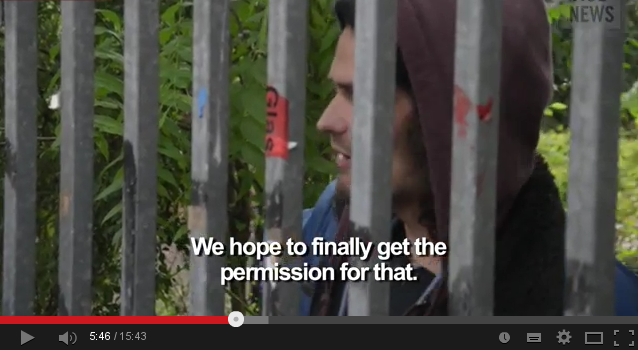 Would you let xberg close its parks for gatherings and protests like in Cambodia? Do you think that restricting ONLY one Shower for 200 people for a year could only cause stress ending in loss of life and do you think this was designed to justify the school's eviction? Historically in Germany, who were those who put trees above humans? Also see Terror or systematic error? False manifestation of the German normality formed by torturing! while big police force with high officers arrested patric peeing and was situated for oplatz eviction, the above paper was given to rbb building their tv tower , which made some phone calls and went then police went and then patric was freed. Hence in the paper there is here hidden information. Ich fass es nicht! Jetzt wird tatsächlich wegen Beihilfe zur unerlaubten Einreise und Beihilfe wegen unerlaubtem Aufenthalt gegen mich ermittelt! Und das alles nur, weil ich getan hab, was der Senat wollte! Sie wollten die Registrierungen der O-Platzleute beenden, und wir sollten sie schnell ranschaffen. Hab doch nur meinen Job gemacht….. Irgendwas läuft hier verdammt falsch! Hence Taina contributed so much to the broken trust and her senders became more untrusted! I am not competent for for checking bills, but i do know that she was pushing both: very aloud and very secretly, the unchecked information leading to hammer of police investigation ending with nothing, only for planting mistrust in the camp and in the movement of those who do something for refugees, while as the deputy of monika, she always have the connections to the control over "the level" of such "police investigation". To me: it is now the time for her to add some clarity to the mass she created! Could this moment of getting be reborn again in o plz, become also a turning point for gattething us with new power, especialy after the green party proven to be so dividing between groups of refugees, while being backed by so havy police power making berlin occuping xberg and protests been forbidden from protection against nature ? A new format to be created by the "pis": The Ganz Unten (At The Bottom) Journal, as an internet platform being printable (for collecting donations). Here is a prediction of a "new" shift, try keeping the gap and keeping the state as mediator and controler, from national money system of central banks + bank to national crypto money system by a "new" crypto coin (similar to bitcoin), but nationalized, centralized and taxable one, for which part like (10%) are (in-home mined. like the printing by central bank, but now by taxable startup companies ), as the coin is distributed personally (to get identification and as the central bank in 0% interest!?) and taxable as shares and not as monay (as the irs imposes on the bitcoin), to keep the control by money in state by the rich 0.?1% via big companies crossing states. Couldn't you imagine google or facebook mining and distributing for free a usacoin just for to continue monopolizing and monitoring societies? eg. isracoin island the cpoin in isalnd and other. since the Vat is applied over transferring money (mainly) between the poor and the "transfer tax" is applied over transferring ownership (mainly) between the rich ones! To increase your social capital you can now Generate your iiaom . scenario: on hello firefox: before A and B entering the room they exchange thair iiaom hash which get positive or negative rating considering in the mutual only after which the session begin. This can be added in webrtc datachannel and even before its session for challenging in the session the reputation of the visitor to the room. It is for equal and free individuals in groups, specifically for Liquid unions, Rcoins and ComComized units, all implementable by the p2proles protocol . 7/7: The first iiaom code is produced and available on github. The next meeting is next week in 19:00 14/7 cbase. iiaom-ASYM(member) being IMG asymmetrically encrypted with the public key of (#R), which is send in uthenticating event to (#R) by the member. 5. the authority identify the member as the one in the picture. in the credibility of the member. and if and when it is required one pulse for all members is performed. -> log folder of files having nickname being (blindly) signed by group's authority (#R). 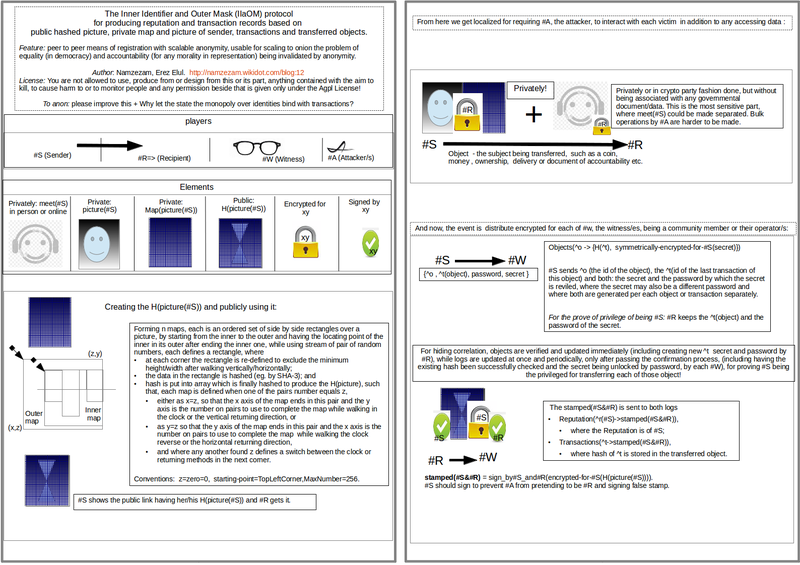 The Inner Identifier and Outer Mask (IIaOM) protocol for producing reputation and transaction records based on public hashed picture, private map and picture of sender, transactions and objects being transferred. Getting localized to scale to onion the problem of equality and accountability being invalidated by anonymity, for to cause the attacker to need interacting with each victim in addition to accessing data. To allow to Interact more with the nearer to reduce the manipulations over you from far, by more being identified by IIAOM, exchanging for Rcoins, and having your equal share of assets in ComComized units, with the nearer! IIAOM(#S) =Hashed((log-rec(II(#S))) used with H(picture(#S)) is used as stamp on transaction for which the recognition was made. Hence, if indeed all #R recognized #S in the picture, with higher N(#S) and bigger record(II(#S)), more authenticated is the identity(#S). After #R already has the public available H(picture(#S)), #R connect to #S to pay, by sending Rcoins, to #R, such that #S sends encrypted for #R the picture and map, then #R hash the picture by the map and only when matching H(picture(#S)) and then recognizing in person or on-line interaction #S as the one shown in the picture(#S), #R sign the transaction as singed_by_#R(encrypted_for_#S(H(picture(#S)))) and send to peers@Op, where the transaction identify the movement of all the coins from being identified with #S to being identified with #R…. #A use face recognition and try to identify the governmental identity, such as identity card, driving license or passport, of #S, by having log-rec(II(#S)) and one of H(picture(#S)) with the map(#S) , but not seeing or having the picture(#S). #A try unhash by the map for getting the picture, without the map this task is harder. In general, when #S pay to #R, witnessed by the peers, the process is of specifically identifying the #S as the owner of the Rcoins and then the #R as the one being identified with them them. When people agree to be equal, the problem in using government tools to prevent multiple human identities is, in our world, where governmental authorities break or can break the constitution of their states, while transferring, or giving a way to, private data to well hidden private authorities. vulnerability: The encrypted picture is of a private and unique element such as organ, like face, or accessory like, secret number. in voting by iiaom , all iiaom are accumulated, then all used iiaom are compared with iiaom->hash(id) in validating for approving or disapproving the voting privilege of that member, where validating returns 2 numbers: Ill= zero or the number of iiaom unkown in validating and the ratio of the number of iioams vs count in validating, as nonzero Ill indicates the voting as ill, and can be creaked per each vote and/or after all the voting. 3. auten(asym,sym,hash,communication) returns (signatures) after human authentication in communication matching all and then delteing the image signing in log and credlbilty . A human non machine authentication and a NOGOYO, which is still aligned with KYC (Know Your Customer) of the USA repulsive Patriot Act of 2001 (of the Project for a New American Century - PNAC - being before the event so obsessive about "catastrophic catalyzing event –like a new Pearl Harbor”), claiming to fight money laundering and being the only case for the stupid money investment trending, such as the one fincancing the Yo application and the traps for locating users by facebook google etc. By a remote trustee signing the match of a specific document of a user with her/his iiaom the iiaom is made trusted as that document and transferable without revealing the document information. The mutual revealing in using iiaom make it expensive for the few to control the many. Once matching the encrypted pictures from the iiaom with the human unique private element, the iiaom is valid except of in MITM eg. in all further communications and transactions, where the MITM can be overcome by parallel communication matching the iiaom again. one must communicate and been seen to see/have the image. no trace in the machin if the orginal image is deleted (so the app should enforce that). familiar practice like in gpg: (reputation is developed and public element like pub key is given and meet-up like crypto party) but without link to others out of the community like the government or identity theft. keeping anonymity by having 2 iiaom-HASH(member): 1st to be authenticated by and 2nd to be blindly signed by, as the member can have more then one iiaom-HASH(member) and is identified uniquely by a static one of the iiaom-HASH(member) and/or a unique username for issues of equality and accountability, whereas any of the other iiaom-HASH(member) are used in transaction made by member. You already now can join, create or host your ComComized collaboration platform, which is partly or fully equally owned by its contributors (some interviews). We are creating the ComComized platform in hope to be useful for club/network of buyers. 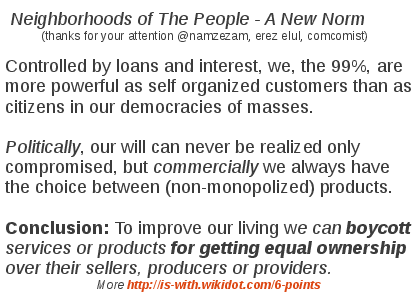 This can be made useful for 3 target groups, namely: customers, small business they buy from, and social oriented business makers ( as ordinary/non-peer partners). This can be developed in 3 steps, namely: 1st customers coming with trademark of their comcomized association to get something like 10% discount, 2nd the association position its people in some corner of the small business to server its members in higher discount 20-30% and 3rd creating real computation against the big markets. 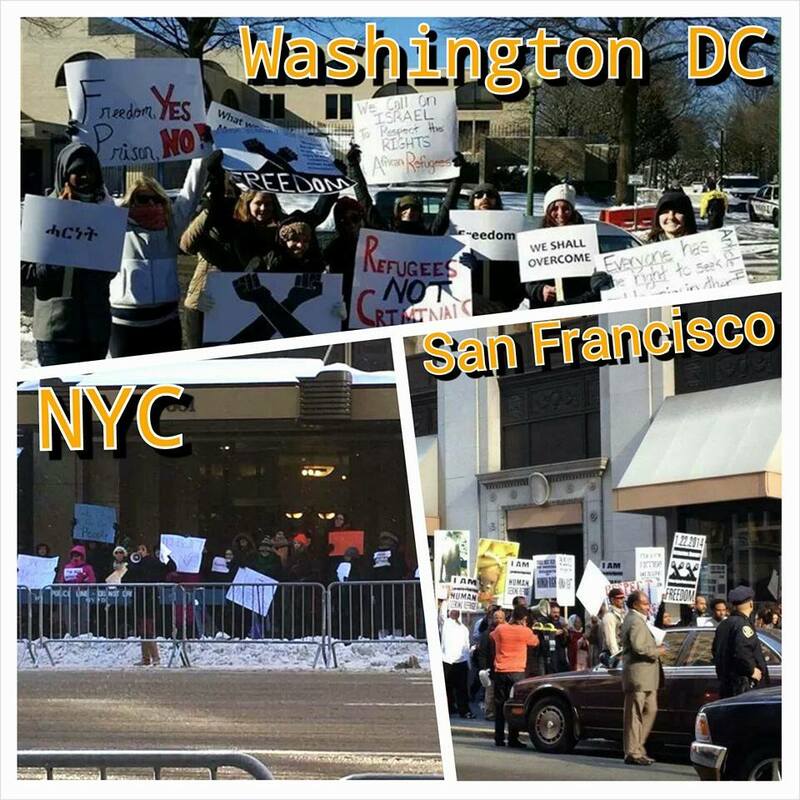 While this is happening the people being organized and costumers could also become more political. The first threshold is to have 1000 people registered for to attract professionals as layers tax adviser etc. the sub-domains are names are categorized by their tld (e.g. 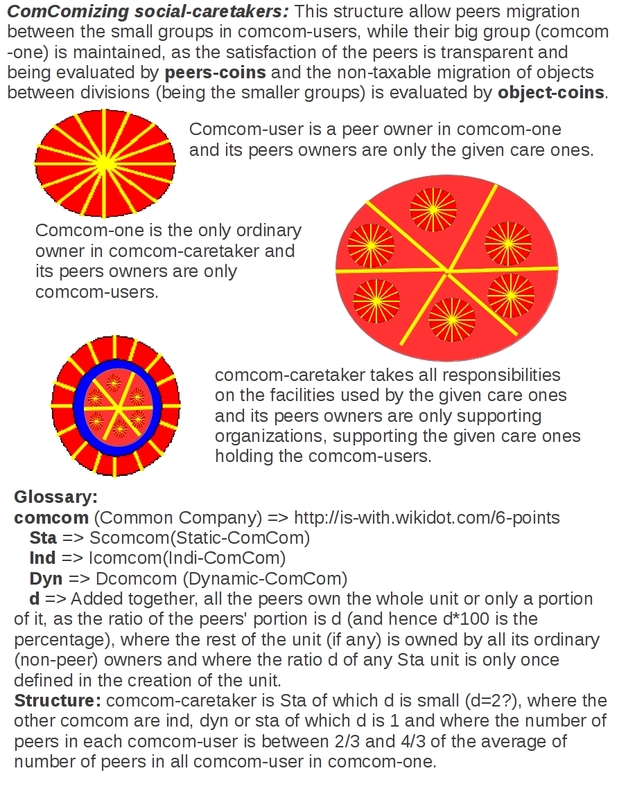 com,net,org,info for the categories groups,users,projects,information-knowledge-etc). for pull of professional to rent able using such imges on such servers or only coninuing from those. multi site forum for the subdomains of all memebers who don't have it otherwise. on comcomized.net/group-name/transactions to build transaction forum of the group, where it is visible only for its members, its body has the groups it holds for which is parameters are visible and the table of the parameters of its non human ownerss . on comcomized.net welcome page + in its bottom forum visible to all members of comcomized.net. Like the open source criteria (which was made for the use of the platforms related to geeknet NASDAQ:GKNT lasting until 2012, now owned by DiceHoldings NYSE:DHX), but without the 6th paragraph specifying "No Discrimination Against Fields of Endeavor". This might be a good idea for you, if only they (the NASDAQ:GKNT), but not you (the contributors) want ALL commercial users and ALL use, including amoral fields, such as of monitoring and torturing by cia and nsa or as the dna research for the Monsanto food production monopoly. Being one of 450m aware users of whatsapp which was sold to facebook for 19b, just for getting you and your data and conncetions, would never happened for the next after whatsup if the one would be comcomized, just because the unchangeability of the common company contract. Why is this crucial now and critical for you and your children? As snowden's files shows, all over the globus, national security agencies collaborate and are controlled by the lobbies of the private companies contracting with such agencies. This amounts to use of army and/or weapon industry against civil population. In our school we learn that the one, designing a gun to kill, is a killer, as the one using it, producing and selling it. 10) Even in Germany, proving Racism in Israel does not constitute Antisemitism! 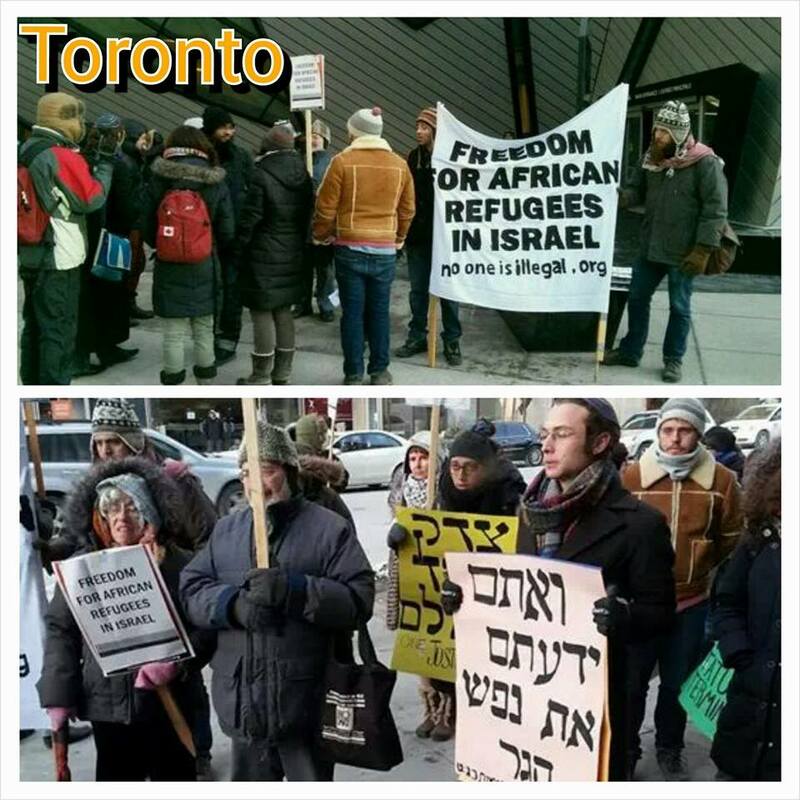 In solidarity with the refugees in israel! In this page I will try to collect some information about some international support to the refugees in Israel. International community : we urge you to advocate that Israel stop our imprisonment and starts respecting refugee rights! Israel’s latest policy of arbitrary detention for endless time without trial continues to humiliate our community. We are turning to you for help and asking you to mobilize towards demonstrations at Israeli Embassies on 22 of January 2014. About 50,000 African asylum seekers and refugees live in Israel. We have fled persecution, forced military conscription, dictatorship, civil wars and genocide. Instead of being treated as refugees by the government of Israel, we are treated as criminals. We live here with no access to basic services, such as health and welfare. A range of unprecedented policy changes has caused us to take drastic measures to display our discontent, frustration and fear. Since the arrival of asylum seekers and refugees in Israel we have asked the Israeli government to improve their asylum policies, recognize us as refugees and give us our rights accordingly. Instead, with every year that passes, we have been criminalized, met with xenophobia and increasingly dehumanizing policies. On December 11, 2013 the government of Israel passed a new amendment to the Prevention of Infiltration law, in response to the recent High Court of Justice (HCJ) decision that overturned previous amendments to the law. In its decision, the Court called the law "a grave and disproportionate abuse of the right to personal freedom” and against Israel’s basic laws. The new amendments allow for one year of closed detention followed by indefinite detention without judicial review in ‘open’ facility Holot, in the Negev desert far from population centers. Individuals held in Holot are banned from working and are subjected to roll call three times each day, restricting travel outside of the immediate area. Holot is closed at night. The law gives the staff of the facility the ability to demand identification as well as to search, prevent entry, apprehend and remove individuals. If an individual breaches or is accused of intending to breach a condition of the ‘open’ facility, or is alleged to endanger the security of public peace, he can be transferred to a closed prison for three to twelve months. Inspectors from the Population, Immigration and Border Authority (PIBA) have begun to arrest and detain hundreds of asylum seekers in Tel Aviv. In the last week of December 2013, PIBA announced its plan to require thousands of asylum seekers and refugees to register at Holot within 30 days. Despite assurances given by the Ministry of Interior that families would not be separated, tens of men with wives and children said they have been summoned. Panic has spread among the asylum seekers community in Israel, as immigration authorities have increasingly limited the ability to renew visas, leaving people vulnerable to losing their jobs and being arrested. 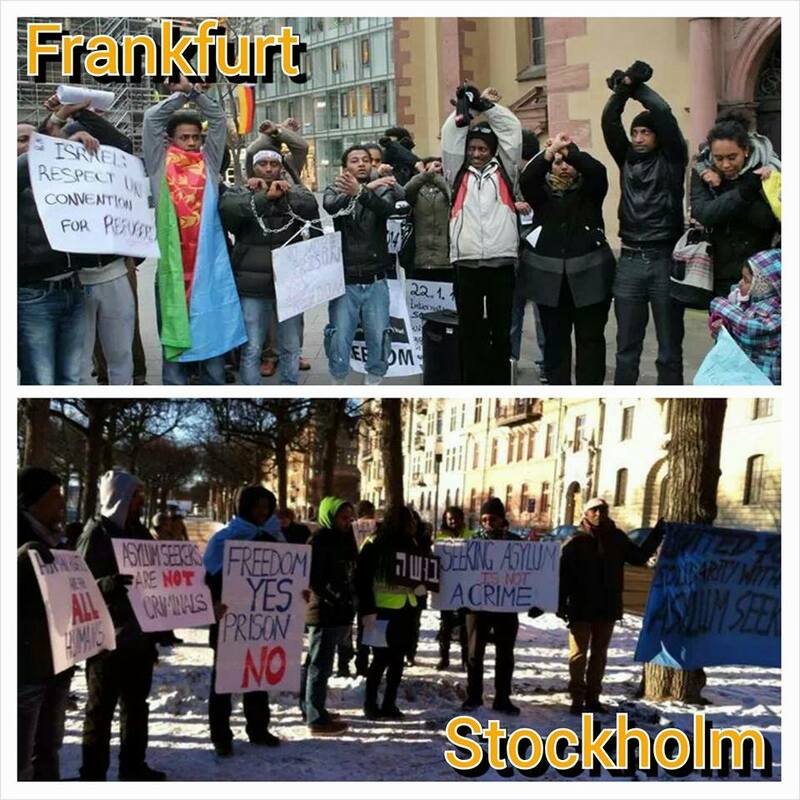 In the past weeks, thousands of African asylum seekers and refugees took to the street in Jerusalem and Tel Aviv to march for freedom, to oppose arrests, imprisonment and Israel’s disregard for refugee rights. The current strike expresses our fear of imprisonment and deportation and pressure the government to change their inhumane policies. 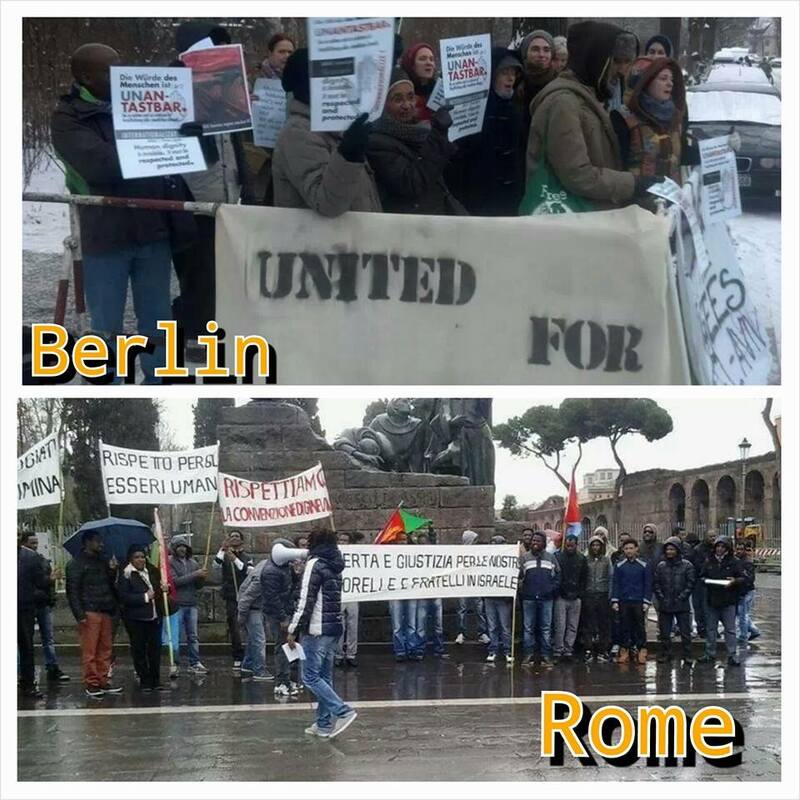 Refugee prisoners in Saharonim jail are on ongoing hunger strike since 5 January 2014. The African Asylum Seekers Committee in Israel is deeply grateful to our friends around the world, who answer our call to support freedom and rights for refugees in Israel. 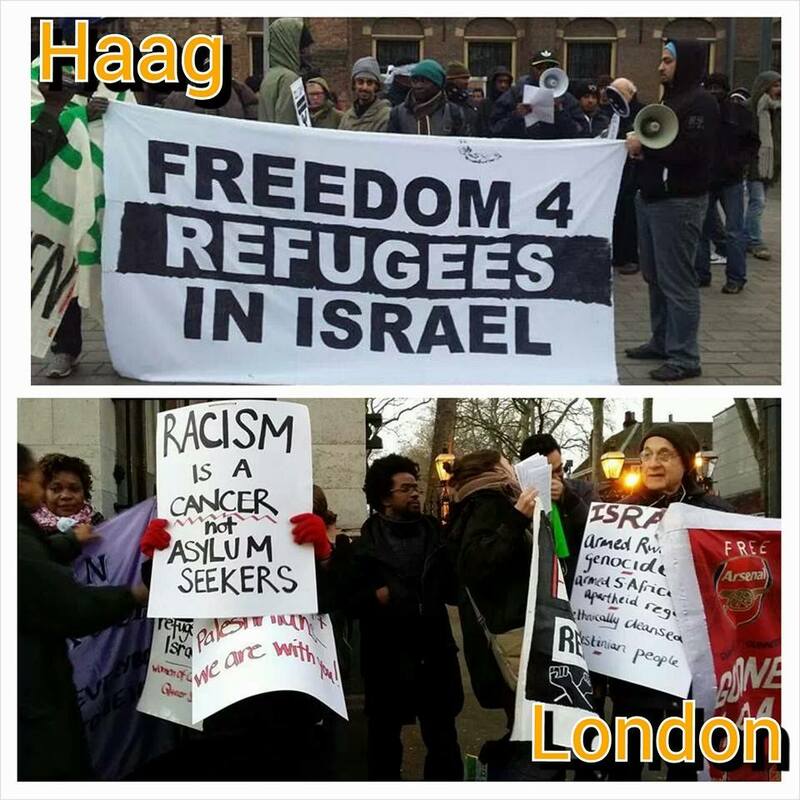 Demonstrations will be held in front of Israel embassies and consulates, UN and UNHCR offices. Letters will be delivered to Israeli ambassadors and UNHCR officials - Demanding Israel stops its policy of imprisonment, recognizes us as refugees and respects our human rights, OR the UN's refugee agency takes immediate responsibility! We stand with all refugees around the world to demand all countries respect the UN Refugee Convention. Please Join the International Solidarity Day with the African Asylum Seekers community in Israel on 22.1.14. In the last few weeks, a range of unprecedented policy changes towards African asylum seekers and refugees have caused us to take drastic measures to display our discontent, frustration and fear. About 50,000 African asylum seekers and refugees live in Israel. We have fled persecution, forced military conscription, dictatorship, civil wars and genocide. Instead of being treated as refugees by the government of Israel, we have been treated as criminals. The Israeli government members have called us a “cancer”, propagating we are “infiltrators” that have come to seek employment. The Israeli Government’s ongoing incitement and hate speech towards us has lead to racial violence and hate crimes against our community. Inspectors from the Population, Immigration and Border Authority (PIBA) have begun to arrest and detain hundreds of asylum seekers in Tel Aviv. In the last week of December 2013, PIBA announced its plan to require thousands of asylum seekers and refugees to register at Holot within 30 days. Despite assurances given by the Ministry of Interior that families would not be separated, tens of men with wives and children have been summoned. Panic has spread among the asylum seekers community in Israel, as immigration authorities have increasingly limited the ability to renew visas, leaving people vulnerable to losing their jobs and being arrested. We stand in unity and solidarity with our fellow communities of African Asylum Seekers and refugees struggling for their human rights in Europe and across the world. Our common plight as refugees must be addressed by a joint struggle and demand for all countries to respect human rights and the UN Refugee Commission. - Hold demonstrations and direct actions at Israeli embassies and consulate offices in Europe, Canada, USA and around the world on the 22 of January 2014. - Send a letter to the Israeli Embassy or consulate in your area to demand Israel stops its policies of detention and deportation, recognizes us as refugees and respects our human rights. - Send a letter to the UNHCR demanding accountability and responsibility for Israel's fulfillment of our rights as refugees. Paris, France - details soon! Frankfurt, Germany - details soon! Refugee prisoners in Saharonim jail are on hunger strike since 5 January 2014. While the right wing governing in israel already use this case to portrait itself as a protector against refugees, the silence in the west (europe and usa) about its crimes is used by the israeli government to show to the israeli society its "success" in its "fight against war refugees" - so much cynical. Why am I doing it? To me History will judge any of us. As Israeli children in school we learned that the only thing we could "do" to the German is to remember and show. For me that lessons is true now for the 50,000 refugees from Sudan and Eritrea being in war zone, while the refugees are silently and unlawfully Haunted to be excluded from the Israeli society. To me, weapon production and exporting to war zones, corrupting government and exploiting lands are good enough reasons to take full responsibility over people running from war, and this as a foundation for any kind of humanitarian societies (of course, before going to war to teach the others some "values"). As for this month the issue is urgent, as the government might be re-challenged in highest court. See this chronic (since 1/2012) of the racist attacks against non-Jewish African asylum-seekers in Israel for several years + Haaretz Editorial 03.01.2014+ in english. yomgashum1@ustream.tv +Tel Tviv. 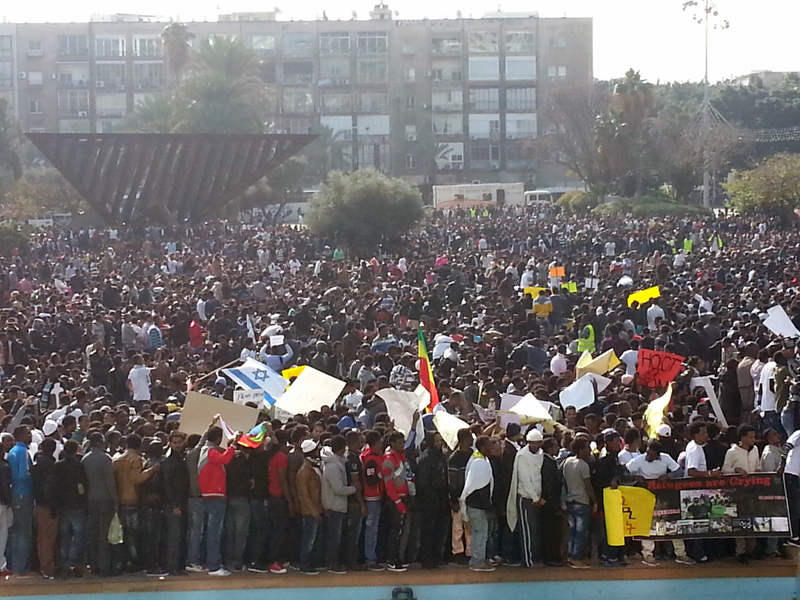 Watch thousands of African refugees participating in a community meeting in Levinsky Park , preparing a three days strike protesting Israeli authorities persecution of refugees and their forced detention. January 2, 2014: In the last two weeks the immigration police is raiding the streets of south Tel Aviv in a manhunt of asylum seekers who have done no wrong. Dozens of people have already been taken to jail facilities and many others are under immediate threat of imprisonment. People are being taken brutally in the middle of the street, on their way to work or for shopping, in front of the devastated eyes of their family and children, who often don't know where their dear ones are being taken to. What is required of you? 3. Come to your shift armed with a camera. Photograph and film the immigration police and share your photos in the event and on your wall using the hashtag #MarchForFreedom. 4. Please be aware that this is a spontaneous initiative by people who care. Participation in the shifts is under the sole responsibility of the participants. Wanted - a platform of flat circles of trustees for distributing information by activists: Each trustee in such circle is signed on all product of the cycle and is available to be challenged by answering the what,who,why for the information and references of information given by the circle, also in replay to challenges, for to produce measures for reliability of each circle by such challenging between such circles , where the focus is clear history and is on reliability even in cost of being faster. producing good random numbers with predictability as for the amount per time , by making it harder to make the number as faster it was made, but only when relying on the goodness of the peers to announce the solution in time, making the mechanism being good only in secretly producing random numbers. And hence with such predictability and with its low transparency level, bitocin, as a global currency, can only become more speculative. 7) "saving it" a lone, in isolation , but not communal, costs more! Good morning, i am after the talk about the rcoin we made yesterday night in-berlin. It was a start, we were only 4 people and it will continue, but i need to think for my self. The hardest thing to accept about rcoin is the reduction of its value (linearly, for simplicity of the calculation of its current value). Like any thing besides money, rcoin is going to die, so it is natural, but people want immortal property because they fear death. People discriminate as they serve debt in slavery until their death and they must be in a community having "Growth" while they prepare wars, why, what is the medium forcing them to become such? The money they have with inflation they prefer over a lifetime limited coin giving each of them an equal dividend from the lost of an individual owner, which is like putting a proportional and automatic communal p2p tax over owning the coin a lone , because "saving it" a lone (in isolation), but not communal, costs more to the community and so also to the individual owning it. 1 why communal <= After mapping what money can buy by near/far and sooner/later we can close the near latter paid by rcoin and the other by money . globalism (and should i specify here China?) destroy social texture for serving credit benefiting only the very few. and example? talar.., bitocin and lightcoin are acting as gold/silver whereas rcoin like local money such as dollar etc. supportive factor ending those who can earn because earning from them..
Let's talk on rcoin - the coin of respect, 2013-11-01 18-22h @inberlin. rcoin - A coin of respect is a time limited and equally re-distributed communal coin. It is daily and gradually losing its value, which is equally gained by the community members. It is not money, nor an equivalent to money, but still a medium of exchange, a credit for exchange and an inner community evaluation tool. Use it for bringing more social justice into your communities for to build up your economy, by advancing community members to get more than the others, only as they are automatically sharing something of their gain with their community members. In initiation, The peers exchange an encrypted asymmetrically and compressed image showing only the peer as that image is indexed by its fingerprint or by other token (e.g. triplepin), where the hash of the image is used as the id of the peer and the (12 hex-digits) hash of that id is used as the fingerprint of that image. 2) the hash of that image is identical to the id of the seen peer. The german new legacy is also exporting its nazism. In 2013 the Poll shows that 60% Oppose Intervention in Syria, so obama send syria kerry to verify use of chemical weapons, but the CIA Files Prove America Helped Saddam as He Gassed Iran in 1988! This site was created to extand the my wikidot porfile.